The deal is already on for this Screamin' Daily Deal. 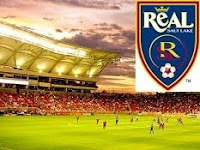 Be there to see Real Salt Lake battle Toronto on September 15th. This is a great deal! Aside from the great price, you're not limited to purchasing only one ticket (purchase of at least two is required). Take a date to see the game or the whole family! I love that I'm getting more and more into soccer. Did you see the World Cup? It was awesome!